Here in the U.S. we shudder to think that dolphins might be on the menu, but it is very common in some countries, even if it is taboo in most of the world. Now it looks like the consumption of animals like whales, dolphins and manatees are on the rise in poor nations, due to the declines in coastal fish catches. People are looking for other sources of meat. According to New Scientist, Martin Robards of the Wildlife Conservation Society in Alaska and Randall Reeves of the Okapi Wildlife Associates in Quebec, Canada have compiled the first comprehensive report of the types and numbers of marine mammals consumed each year. They reviewed about 900 sources and found that large-scale whaling has decreased in the last four decades. That’s good news for whales, but other marine mammals are in still in danger. Maybe more so because of this. With other protein sources scarce, smaller cetaceans are also being eaten in places like the coastal areas of west Africa, Peru, Brazil, Colombia, Trinidad and Tobago, Madagascar, Sri Lanka, India, the Philippines and Burma. 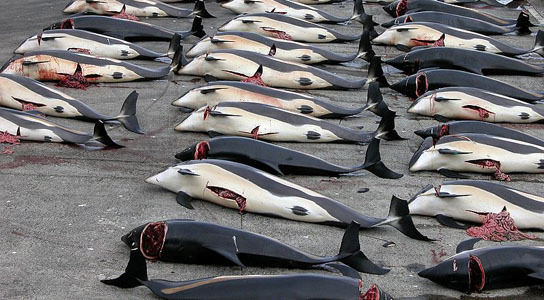 In fact, from 1970 to 2009, at least 92 species of cetaceans were eaten by humans. We will have to keep an eye on this coastal fishing decline and it might be wise to begin to look for ways to boost populations, before more species become endangered due to our need for meat. Be the first to comment on "More Dolphins Being Eaten In Poor Countries"